Social media has been a powerful tool in spreading Rotary’s message. 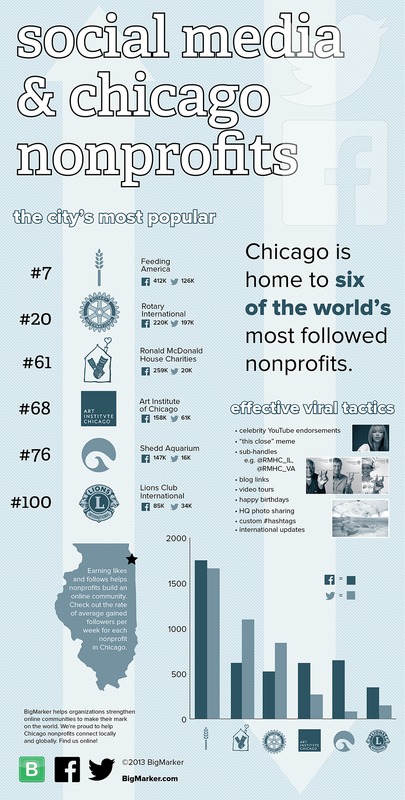 When BigMarker conducted a survey this summer of which nonprofits in the Chicago market had made the biggest impact on social media, Rotary came out on top in our use of Twitter and Facebook (231,000 Facebook likes and 204,000 Twitter followers), second in use of all social media in the Chicago area, and 20th in the United States. I was approached by BigMarker to answer a few questions for their blog on what it took to cultivate our social media presence. Here’s a bit of what I shared. You can see the full article here. How important is social media to your online communities? Social media has become increasingly important for Rotarians and the organization because it allows us to interact and learn from one another, which people do on our 40,000 member LinkedIn group. I’ve learned a lot from Rotarians about what’s important to them in their communities, and several Rotarians have told me that LinkedIn has helped them feel the global reach of an organization that is so much more than their local Rotary club. Social media also has been a great way for Rotarians to be made aware of the work of other Rotarians around the world. For example, I recently did a Facebook post to let people know about flooding in India and how they could help, and I recognized the work of one of the Rotarians in that effort, Dr. Nischal Pandey. He then went onto Facebook and responded to comments people had. It’s good for people to see that they can interact with the people we’re writing about. What are three important things to maintaining engagement with followers? The most important thing for engagement is to listen and respond. I understand that sometimes people don’t like every policy about Rotary, and they say so. That’s OK. We listen to what they say and respect how they feel and think. And it’s important to always, always be honest with people. On social media, it’s better to be authentic and not quite perfect than smoothly polished around the edges but not really saying anything of value. Your integrity and the care and concern you have for your members/customers is critical. What have you learned from working in social media and what is your end goal for using social media? From social media, I’ve learned how wonderful the Rotary story is. It may have different looks and flavors in different parts of the world, but the heart of it is the same everywhere. Rotarians worldwide want to leave the world a better place than how they found it. We’re all connected and in this together. Rotarians have taught me how much we can do when we work together. What I want from social media is to tell the Rotary story and to help others tell that story as well. This entry was posted in Building community, Developing leaders and tagged social media by Rotary International. Bookmark the permalink. I am very glad I noticed this posting and plan to share it and use good material in my club and district. The amount of money that’s in your bank at the time of death,is the extra work you did which was not necessary.So do the work to the needy community for the mankind. As a Rotarian and Polio Plus supporter I’ve followed the story of the capture and assasination of Osama Bin Laden with interest, especially after hearing the concerns about use of a CIA operative masquerading as an immunization official to gather DNA evidence on Bin Laden’s relatives in the compound. The seqeullae of this including murder of a Rotarian District governor and numerous immuinzation workers has been very concerning. Social media is a great way to get out your point of view as Rotarians, and I’ve spread word of this on Facebook and Twitter, as well as on my blog at http://drpullen.com/wasgettingbinladenworthit Keep up the good work. Thanks. Pingback: Cultivating a powerful social media presence | Love to read, love to learn! I would like to know if it is possible to recive , where to find or how to translate to spanish all these information. I have a lot of friends in my Facebook to re-send the information buy in spanish. Please let me know something about different possibilities. Thanks.